Want an quick and easy projects you can complete this summer? Sign up for Sue Daley's Little Things Block of the Month. 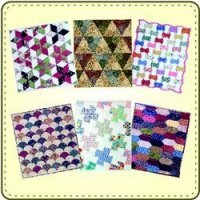 Each month you will receive a pattern, papers, acrylic templates and fabric to create a fun English Paper Pieced wall hanging. Projects measure 12'' wide x 12''-14'' long. This six month block of the month is $34.99/month. Get yours today! The newest and updated Quilter's Travel Companion book is now available. Don't miss any quilt shops while you're on a road trip with your family and friends this summer. Hooray! Our Street Is Finished! Our street is done and we want to Sale-abrate! From Thursday to Saturday, May 29-31, everything in the store is buy two and get one free (of equal or lesser value, excludes chintz and classes). Buy two yards of fabric, get one free. Buy two kits, get one free. Buy two notions, get one free. Shop early and often. Everything is going to be flying off the shelves. A reminder for you Lucky Penny Club members! Your Lucky Penny Club meets Tuesday, June 3, from 10 a.m. - 2:30 p.m. Let's get our machine applique projects completed. If you'd like to join in on the fun, sign up for next quarter beginning Tuesday, July 1. Enroll today. A reminder for you Tips & Techniques members! Your Thursday Tips and Techniques Club meets Thursday, June 5, from 6 p.m. - 8 p.m. and for Monday club members, Monday, June 9, from 12 p.m. - 2 p.m. You are not going to want to miss any techniques MJ will share with you. If you'd like to join in on the fun, sign up for next quarter beginning Thursday, Sept. 4, and Monday, Sept. 8. Make your reservations today for Quiltapalooza on Sunday, June 22, from 2-5 p.m. to ensure yourself a spot. We are limiting the number of spots to 50 this year to ensure everyone is able to experience and enjoy the new products. Guests will pay $10 in advance to secure their reservation and receive a $10 discount on Quiltapalooza purchases made that day. Once we meet the 50 person limit, we will open an additional session for sign ups. Register today.